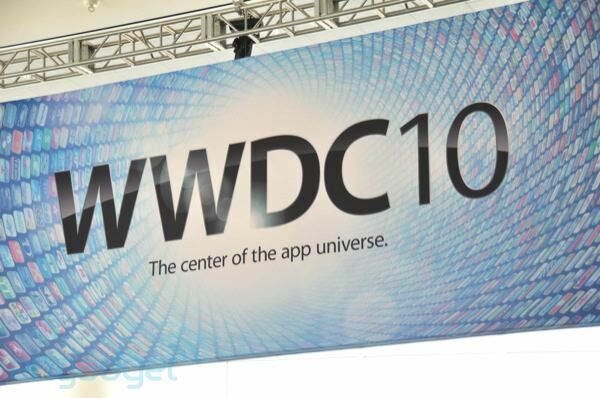 We will be posting the latest info as we get it about all devices running iPhone OS. This includes the iPhone, iPod touch, iPad, and maybe the new Apple TV. The developer of elements app earned more on the first day of iPad launch than 5 years of Google ads. You can now view PDFs in iBooks. We put a little selector right at the top so you can select between books and PDFs. Whole new bookshelf for just PDFs. You can now make notes on your bookmarks. Netflix app for the iPhone coming this summer for free. Farmville coming to the iPhone, syncs with Facebook app, released by end of June. Updates to Guitar Hero app with new strumming feature. It’s 9.3mm thick, 24% thinner than the 3GS. 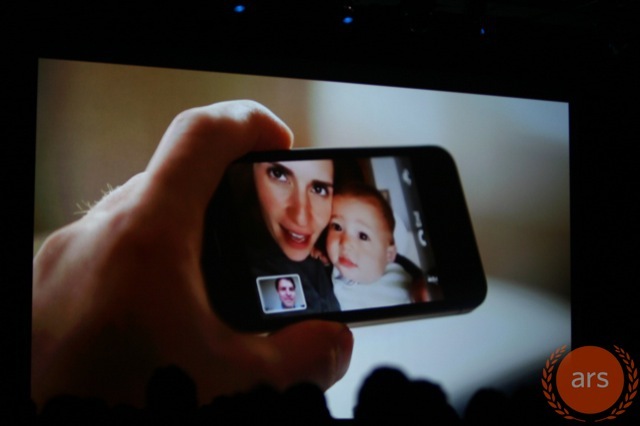 Confirmed front facing camera, LED Flash on back. Metal band around outside is antenna system. New display with 4x pixel density, 326 pixels per inch (human eye detects only 300), 3.5″, same size as 3GS, but at 960×640 pixels (4x more pixels), 800:1 contrast ratio, iPhone OS 4 automatically makes apps upscale to new resolution. 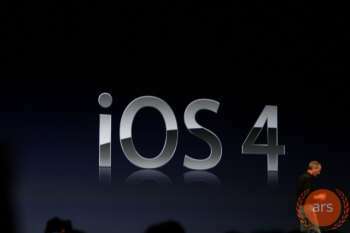 iPhone OS 4 name is being renamed to iOS 4. Microsoft’s Bing will be an option for search within Safari but Google will stay the default. iOS 4 Golden Master Candidate out today for developers! 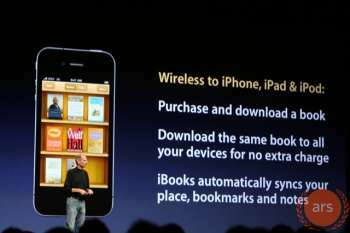 iBooks coming to the iPhone & iPod touch with iOS 4. Sync iBooks notes, bookmarks, etc, across all devices. iAds will begin showing up on July 1st. 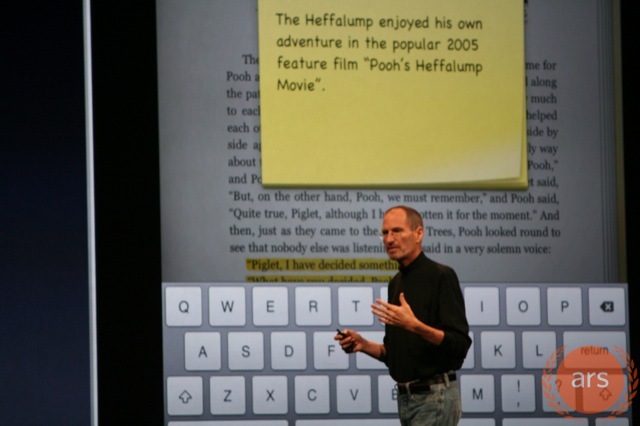 Steve Jobs calls friend Jonny Ive over video chat on the iPhone 4. It’s called FaceTime, Wifi only during 2010 until networks can support it, use front or rear camera, switch cameras during call. 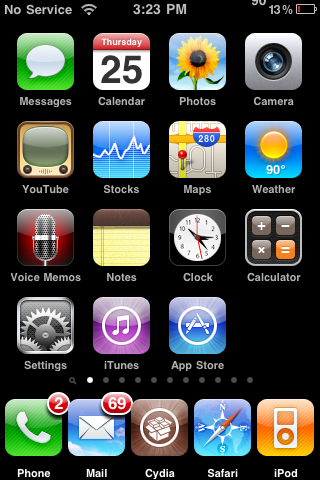 iPhone 4 comes in black and white, $199 for 16GB, $299 for 32GB, With AT&T: if your contract expires anytime in 2010, you are immediately eligible for a new iPhone 4 at the same $199 or $299 prices if you top up your contract for 2 years, up to 6 months early eligibility for an iPhone 4. On sale June 24th, preorders start June 15th, ships in 5 countries: US, France, Germany, UK, Japan. iPhone 3G now gone, iPhone 3GS $99 for 8GB starting June 24th, 18 more countries in July, 24 more in August, 40 more in September. iPhone 4 Dock will be $29. Apple will make own case for iPhone 4 in multiple colors. iOS 4 firmware upgrade is free for all supported devices. Live Cams is one of the few apps that make it right on the front page of my iPhone. I’ll tell you the reason right up front before the entire review. I only use a few of their features but there are many more. So why is it on my front page? Because when opening the app, I can customize it to show thumbnails of the camera’s I’ve added myself. I’ve got it set to show 8 cameras all at once, then I tap on a camera to see it full screen. This way I can monitor all of our cameras at work from anywhere. The reason I can do this is because the app lets you customize what tab gets opened when the app loads. Now for some of the many features offered by this app. The first tab is the search tab. Once opened you see a list of presorted categories of cameras. If you’re looking for a camera in your locations or of a specific topic not on list there is a custom search button in the top right. This is more like an advanced search not just giving you the option to type in your search but from what category, country, state, and more. For the example below, I did a search for Hawaii. 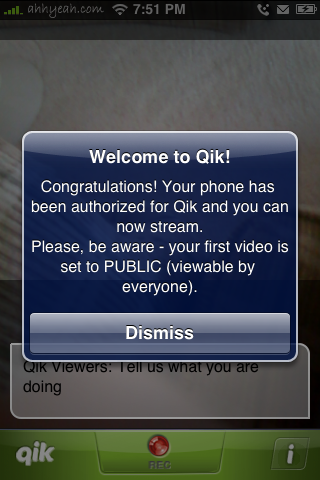 Stickam has recently released an iPhone app that allows you to view streaming video channels live to your iPhone. It doesn’t have a ton of features but it doesn’t really seem to need them. You can sign in or create a new account. You can chat live in both horizontal and vertical mode and you can search. The channels are sorted by Featured, Friends, Shows & Social. I think I would only use it for watching twit.tv live but it would work well as a security camera for your self too. You can set up an account at Stickam.com and stream your webcam to a channel. Then load it up on your iPhone and your good to go. I have had quite a few people asking me about the LiveClock mod (a mod that displays the current time on your Clock icon) and whether or not it works on the 3.0 firmware….the answer is, yes! The first time you install the mod, it will be over the top of your Stock icon which makes it look weird because it will have two hour, minute and second hands. All you need to do is go into WinterBoard and disable LiveClock. Your iPhone and/or iPod Touch will respring. Now, go back into WinterBoard and uncheck the LiveClock Disabled option…your device will respring again and voilà you will have the LiveClock mod (working correctly). You can get this mod via the iSpazio source. The Ustream.tv Mobile app has to be one of the coolest apps that I have played with. On my personal website (justinvanrheenen.com) I have a section on my sidebar for live streaming from Ustream.tv. I really haven’t used this much but this mobile app may make it easier to live stream whatever my heart desires. To get instructions for the download, you can go to Ustream.tv/mobile. 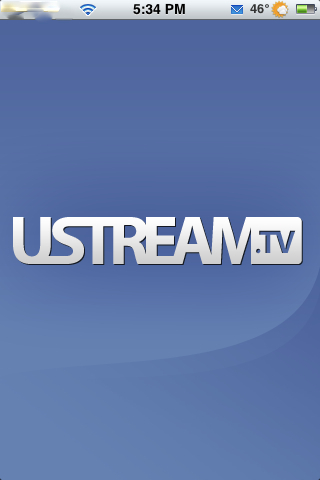 You will need to sign up for a Ustream.tv account if you do not currently have one. Once you have set up your account, open Cydia. 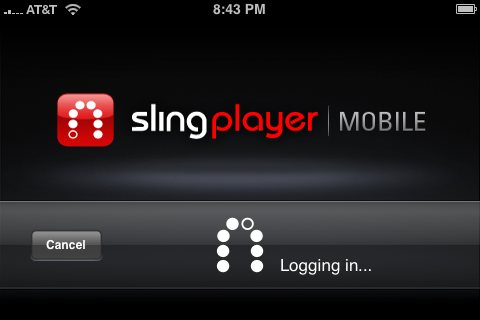 If you have not jailbroken your iPhone yet, you will not be able to use the Ustream.tv Mobile App. You can download a Ustream.tv Watch App from the App Store but to be able to live stream from the phone, you will need to jailbreak your phone. 1. Once you have opened Cydia tap “Sections” at the bottom. 2. On the next screen, tap “Multimedia”. 3. Then tap the letter “u” to find the UstreamBroadcaster. 4. Then install and confirm the installation of the app. More info at their site and a full review soon! Doug and Brooke are still broadcasting live from the Apple store at Jordan Creek Mall in Des Moines. Video below. For the latest information, scroll down to read the 9:30am update. Doug and Brooke have their new phones and are on the way back to their house. Soon as they get back, they will be writing more articles and probably start live streaming again. Video embed after the jump. Friday, July 11th Doug and I will be at our local Apple Store bright and early. 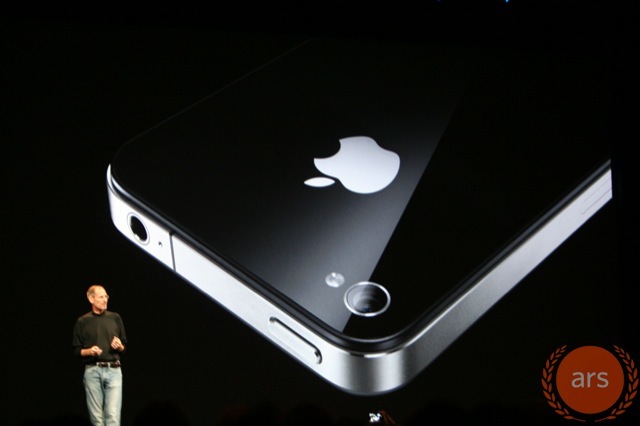 We will be live streaming the launch of the iPhone 3G starting between 7:30-7:45am CST. You will be able to watch everything from waiting in line to purchasing the iPhone 3G to the unboxing of our new iPhone’s…all live. 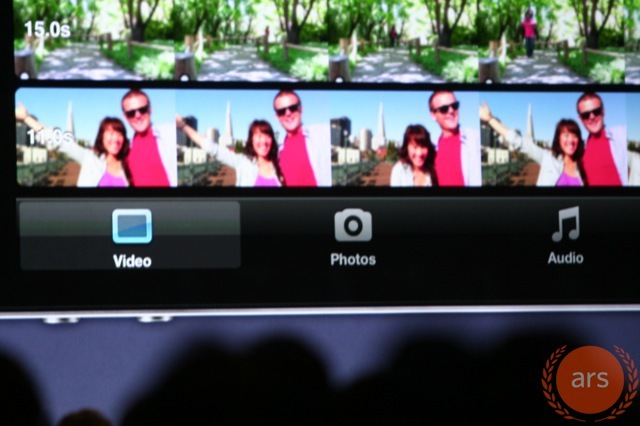 When you visit AppleiPhoneSchool.com tomorrow morning, the live video feed will be embedded on the front page. We will also be embedding our chat below the live video feed, that way you guys can chat about what is going on. It should be a good time! The update to Euro2008 version 1.6 adds Chinese to the list of available languages. Other than that, there are no visual changes to the application. Euro2008 is available through the iSpazio source.